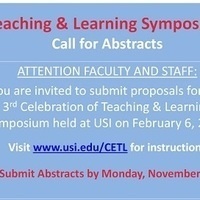 You are invited to submit proposals for the 3rd Celebration of Teaching & Learning Symposium, held at the University of Southern Indiana. The Symposium welcomes works that focus on improving student learning and academic success in any higher education setting. These works include the implementation and adaptation of effective evidence-based instructional strategies, development of innovations in teaching and learning, and results of scholarship of teaching and learning (SoTL). Topics include improving student engagement and motivation, learning in specific settings or contexts, and fostering inclusion and civility. Works in progress are welcomed. The Symposium is part of CETL’s Making Teaching and Learning Visible initiative. It will provide opportunities to share teaching efforts in support of student learning and interaction among participants across disciplines in oral and poster/demonstration presentations and a plenary luncheon.